We Have a Long History of Making a Difference. The National Endowment for Financial Education (NEFE) launched its first financial education program in 1984 and has been creating programs to help consumers better understand their finances ever since. The Denver-based, nonprofit College for Financial Planning was established in 1972 as the nation’s first financial planning educational institution providing financial planning course work to professionals. At that time, the College also created the standard-setting CERTIFIED FINANCIAL PLANNER™ certification, which helped define the concept of financial planning and establish it as a profession. The College grew, diversified and advanced its interaction with the public over the next two decades. NEFE evolved from and served as the parent entity of the College from 1992 to 1997. In 1997 the board and trustees recognized the importance of focusing the foundation’s efforts primarily on educating consumers—particularly those segments of the population whose needs were not being met by others. NEFE transferred ownership, sold its assets—including all of its professional education programs—to the Apollo Group, Inc. and established NEFE as an independent, nonprofit foundation solely dedicated to educating consumers about personal finance. The College for Financial Planning defines the concept of financial planning and establishes the CERTIFIED FINANCIAL PLANNERTM (CFP®) designation for financial planners. High School Financial Planning Program® (HSFPP), a free resource focused on basic personal finance skills for teens, launches. 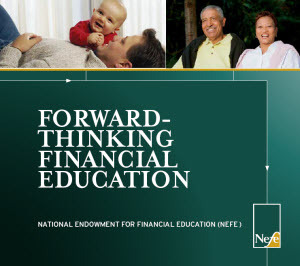 The National Endowment for Financial Education® (NEFE®) begins serving as the parent entity of the College for Financial Planning. NEFE is among the founding members of the Jump$tart Coalition for Personal Financial Literacy. The board of trustees makes the bold decision to focus efforts solely on its public service mission and NEFE transfers ownership of the College for Financial Planning and related divisions to the Apollo group; creates endowment from proceeds of sale. NEFE launches Smart About Money, the first of several educational programs developed to meet the specific needs of various audiences. William Anthes, Ph.D., ends his 26-year association with NEFE and the College for Financial Planning announcing his retirement. Ted Beck his named his replacement as president and CEO. NEFE launches CashCourse®, a free online resource designed specifically for college and university students. In partnership with the University of Arizona, NEFE begins the first-of-its-kind longitudinal study of college students following their financial journey to adulthood. Ted Beck is appointed by President George W. Bush to serve on the President's Advisory Council on Financial Literacy. Beck serves on the Council from 2008-2011. Ted Beck is appointed by President Barack Obama to the President's Advisory Council on Financial Capability for Young Americans. Beck serves two terms on the Council from 2011-2015. NEFE launches the Financial Education Evaluation Toolkit®, an online evaluation tool to help financial educators evaluate the impact of their programs on learners. NEFE launches On Your Own, a blog dedicated to helping young adults take control of their financial futures. The NEFE High School Financial Planning Program (HSFPP) celebrates its 30th year. The youth education program reaches an estimated 800,000 to 900,000 students each year. NEFE launches Financial Workshop Kits, a resource to help trainers deliver educational resources to diverse audiences in their communities. Ted Beck announces his retirement from NEFE after 13 years leading the organization. Billy Hensley, Ph.D., is appointed his replacement as president and CEO.